Literally one was so grateful and appreciative to have been invited to friend's birthday dinner with a group of fun friends (about 20 of us in total) recently. 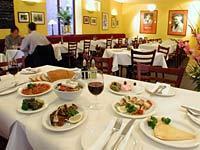 The destination was Kri Kri Mezethopoleion Greek Restaurant at 39-41 Little Bourke Street in the City. It was perfect. On a warm evening (last Saturday night at the time of writing this) it was only fitting for our group to be sitting near the open windows drinking a few glasses of red and ordering the dinner banquet to share. For only $45 per person, we left feeling incredibly full, not to mention an additional slice of birthday cake the restaurant served up for each one of us. However you could not please everybody at the table at once; but if you love octopus, calamari, sausages and haloumi cheese - your culinary dreams have literally just come true. The banquet is spaced out, and the wait staff are incredibly fast on their feet. Despite a few of my male friends having a few beers too many, all in all we only paid $556 for delicious food, drink and coffee (not to mention the complimentary slicing of the cake in tandem with keeping the dishwashers very busy) and did I mention the great conversations amongst the 20 of us, and considering that we were all at the restaurant for almost four hours, the hospitality was top notch. Kri Kri Greek Restaurant is definitely a great place to dine out at least once, and even if Greek food is not to your liking, you will be pleasantly surprised and your taste buds will thank you for it. No wonder this restaurant is packed out, and bookings should be made in advance. This restaurant also awards their customers who are members of the Qantas Frequent Flyer Program (yours truly just scored more abundance) where for every dollar you spend you earn three (3) Qantas Frequent Flyer points, and even more when you pay the bill with a Qantas Frequent Flyer linked credit card depending on the terms and conditions on your card. Walking straight home to my city apartment would not have done this outing any justice. It is perfectly normal to head out to a nearby city bar or nightclub to continue this amazing night out with a great group of like-minded friends. Amen.